Camille Pissarro, the Impressionist painter of French descent, was born in 1830 on the island of St Thomas in the Danish West Indies. At the age of twelve he went to Europe where he attended a Paris boarding school. During his time in Paris he studied at various academic institutions including the École des Beaux Arts and Académie Suisse and under a succession of masters such as Corot and Courbet. In the 1860’s he, along with Monet, became involved in the Impressionist Movement and spent most of his time painting urban and rural pictures which illustrated French life of that era, particularly in the area around Pontoise. Pissarro died in Paris in November 1903 and was buried in Père Lachaise Cemetery, Paris. 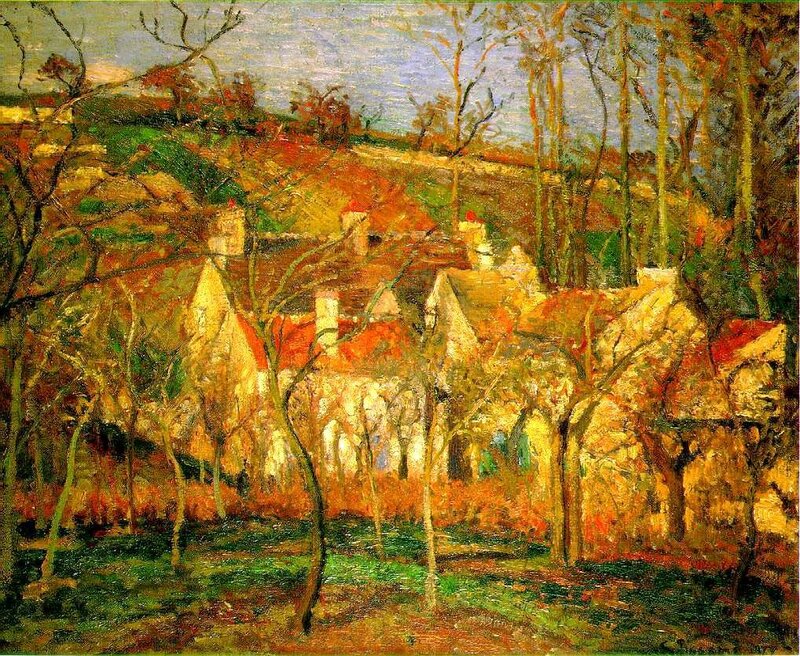 Painted in 1877, today’s painting is entitled The Red Roofs and is a small (55 x 85cms) oil on canvas picture which hangs in the Musée d’Orsay. The location for this painting is a group of farm buildings called La Côte des Boeufs, near Pontoise. The painting is complicated by the fact that the artist wanted to show the buildings as seen through the trees but the screen of trees makes us look quickly beyond the trees, into the heart of the painting, and by doing so one can differentiate the many layers of colour. Today’s painting in My Daily Art Display is one that art historians have written about probably more than any other with the exception, maybe, of Da Vinci’s Last Supper which of course received renewed speculation after Dan Brown’s novel. 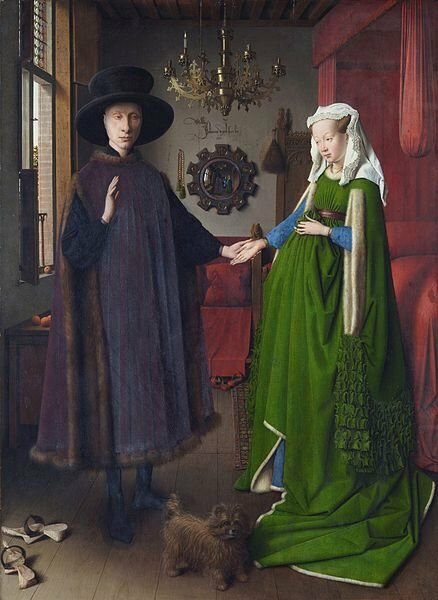 The Arnolfini Portrait which can be seen at the National Gallery, London was painted by Jan van Eyck around 1434. The two main characters in the painting are Giavanni Arnolfini and Giovanna Cenami. Art historians have looked at the painting and tried to decide whether this is a picture of their wedding or just one of their betrothal ceremony. Was the lady pregnant or was that just a fashion style of the day? Much has been written about the symbolism of the dog, the oranges, the mirrored reflection and virtually anything you can see has been given an interpretation of its symbolism. Notwithstanding the symbolism and the many interpretations I believe it is a painting of haunting beauty. Lucas Cranach the Elder was born Lucas Sünder in Kronach, Franconia in 1472 but later changed his surname in honour of his German birthplace. Moved to Vienna in 1501 where he stayed for three years during which time he painted some of his finest and most original works. Several of his religious works of that period show a remarkable feeling for the beauty of landscape characteristics of the Donnauschule (Danube School), which was a group of German and Austrian artists of the early sixteenth century, who were among the pioneers in depicting landscape, in particular those of the forests and hills of the Danube, for its own sake, in drawings and prints as well as paintings. Today’s painting in My Daily Art Display is Lucas Cranach the Elder’s Adam and Eve painted in 1526 and is one of 50 depictions Cranach did of this subject and this depiction is inarguably the most beautiful. In this earlier depiction, the tree of knowledge stands in the centre of the painting between them and they are surrounded by painted wildlife and green pastures. Eve raises the fruit to give to a confused Adam. The painting shows the skill Cranach had in painting wildlife and game and his continued attention to detail, for example, the reflection of the Deer in the pond and the Unicorn in the background. The portrayal of Eve shows his growing attention to portraying the female form, which becomes more evident in paintings such as The Venus (1532). Throughout his career Cranach used his artistic talents to further the Lutheran cause. 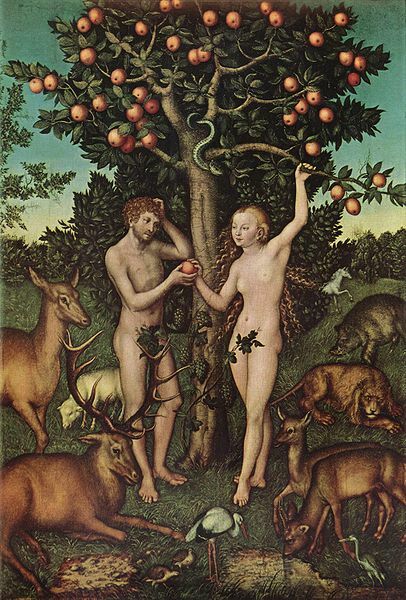 In depictions such as Adam and Eve, Cranach was able to develop his talent in detailed studies of wildlife, nudes and landscapes with no objection from Luther, who saw Cranach’s depictions as furthering the biblical message. Hans Memling was born circa 1433 in Seligenstadt, a small town close to Frankfurt. Although German by birth, after serving his apprenticeship in the Cologne/Mainz area he moved to the Netherlands where he is believed to have been worked under the tutelage of Rogier van der Weyden. He later moved to Bruges and was admitted to the Painters’ Guild of Bruges in 1466. He soon became the most popular Netherlandish painter of his day. His popularity as a painter earned him many commissions especially from the rich Florentine merchants of the city, such as Tommaso Portinari, whose portrait he painted. He soon became one of the wealthiest citizens of Bruges. He painted many portraits and religious paintings and his works can be seen in all the major galleries of the world as well as a museum in Bruges which is devoted to him. Memling died in Bruges in 1494. My Daily Art Display Today is Hans Memling’s Scenes from The Seven Joys of the Virgin, painted in 1480 and now in the Alte Pinakothek, Munich. The painting was commissioned by the tanner and merchant Pieter Bultnyc and his wife Katharina van Riebeke for the chapel of the Tanner’s Guild in the Church of Our Lady in Bruges. The painting incorporates the figures of Bultynyc and his son kneeling at the lower left, outside the stable where Christ is born. Katharina van Riebeke is also in the painting, at the lower right, in front of the scene of the Pentecost. This is a picture with an astonishing combination of scenes illustrating parts of the New Testament. The landscape is very much manipulated, segmented into neat vignettes. It is sumptuous, showing all the various possible geographies of earth: land, mountains, sea. There are towns and castles, meadows and winding roads. There are no fewer than twenty five scenes beginning with the Annunciation of Christ’s birth to the Virgin Mary in the upper left part of the painting through to her death and assumption in the upper right segment of the work. The ‘Nativity’ is the central scene. Other smaller scenes are the ‘Resurrection’, the ‘Visitation’, and the ‘Entry of Christ into Jerusalem’. Raphael was commissioned by Pope Julius II in 1510 to decorate with frescos the walls of his private apartment, now known as the Stanze di Raffaello in the Apostolic Palace in the Vatican. For Raphael, this must have been a daunting task as he had never worked on a project of such magnitude and he had little experiencein fresco. 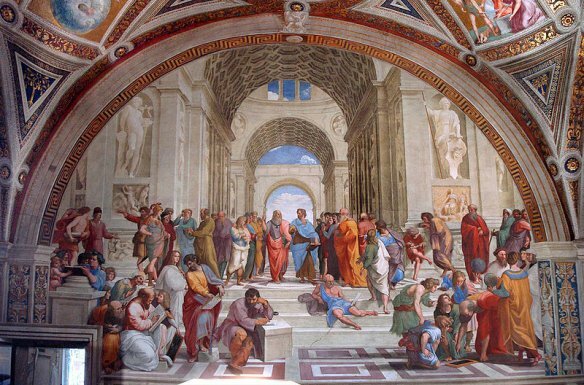 The second of his frescos entitled The School of Athens was on the wall of a room, known as the Stanza della Senatura and is one of the most famous paintings by the Italian Renaissance artist. This room was intended by the Pope to be filled with portraits of great intellectuals of the ancient world. The fresco is a who’s who of the famous thinkers of the past and there have been many arguments when it comes to identifying the characters of the fresco. Giovanni Bellini was born in Venice around 1430 and was one of the greatest and most influential artists of the Italian Renaissance. He came from a family of artists. His father was Jacopo Bellini, an artist, and Giovanni and his brother Gentile trained under him. His sister married another great Renaissance artist Andrea Mantegna. Giovanni had a long and prolific career living to the age of 85, during which he transformed Venice into a centre of artistic excellence which rivaled Rome and Florence as established centres of art. Venetian painting rose to prominence during his time through his use of colour, light and atmosphere. Bellini was a master of portraiture and today’s art display is one of his most famous works of portraiture, Doge Leonardo Loredan. This portrait hangs in the National Gallery in London. Bellini completed this painting around 1502. 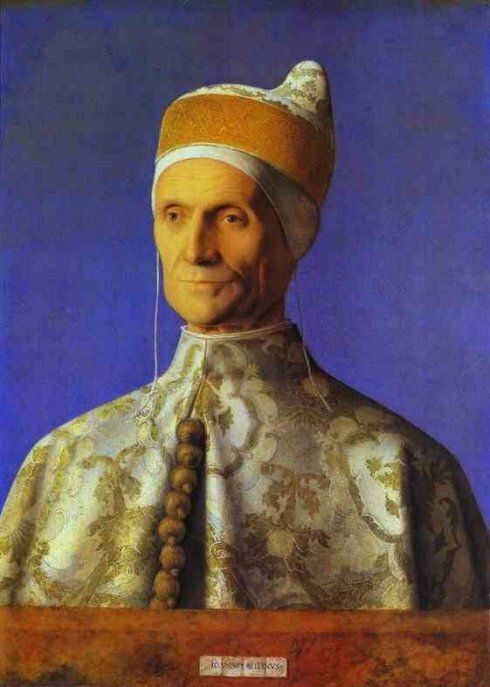 This formal portrait of the Doge at the beginning of his rule shows the hat, called a corno, which was worn over a linen cap. His robe is made of luxurious, gold-threaded damask and is decorated with ornate buttons which were part of the official wardrobe. This was a traditional style of portraiture for incumbent rulers of the time. The style of this portrait is similar to the style of sculpted portrait busts which were often inspired by Roman sculpture. Bellini’s signature can be seen below on the parapet in the form of a cartellino. A cartellino being a piece of parchment or paper painted illusionistically, often as though attached to a wall or parapet in a painting, commonly with the artist’s name or that of the sitter. Guido Reni was born in Bologna on November 4th 1575. He studied art from the age of nine as an apprentice under the Bolognese Studio of Denis Calvaert. At the age of twenty he worked in the Accadmi degli Incamminati (Academy of the newly embarked, or progressives) under the tutelage of Ludovico Carracci. This academy was one of the first of its kind in Italy and singularly helped to encourage the so-called Bolognese School of the late 16th century. His most celebrated work, Aurora, painted in 1614 is an enchantingly beautiful ceiling fresco of the large central hall of the garden palace, Casino dell’Aurora, which was a commission for Scipione Borghese. Although he was highly successful in Rome, he returned to Bologna. After Ludovico Carracci’s death in 1619, Reni was unrivalled as Bologna’s most important artist probably the most sought-after painter in Italy. Reni died in Bologna in 1642 aged 66. Today’s picture is one I saw at the National Gallery, London and is entitled Susannah and the Elders. The incident depicted in this painting is taken from the Old Testament. As the virtuous and beautiful Susannah bathes in her garden, she is approached by two elders who, lusting after her, threaten to accuse her of adultery if she does not sleep with them. She refuses and is falsely accused by them, but her innocence is proved and prevents her from being stoned. There have been many other versions painted of this scene including one by his former master, Carracci.